Fencing is sourced from local sawmills and can be bought treated or untreated, we would recomend buying treated wood as it can be pressure treated and will not require painting. This will have to be painted or treated annually in order to protect the fence from the elements. Fences can usually completed in a day or so depending on size and availibility of materials. 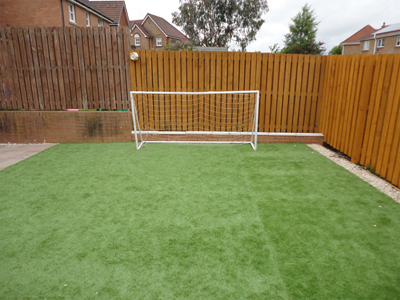 The picture on the left shows an astro turf laying that was carried out by J I Fairbairn as well as the fencing. The colour of the fence was chosen by the customer therefore on this occasion untreated wood was purchased and painted to the customers specification. Fencing materials other than wood can be used to provide the same privacy and weather protection, available for example are bamboo screens and sectional windbreaks in order to enclose areas and provide better shelter. Fencing panels would be sourced wither from a local sawmill or one of the Hardware Stores for example B&Q or Homebase. If you have already obtained your fencing please contact us for installation. We are extremely flexible when it comes to pricing and materials and would always endeavour to ensure that you get the best value for money on materials.